(KINGSTON, Ont.) – An eastern Ontario technology company based in Napanee and Kingston is the winner of an innovation award for its software developed for the window industry. 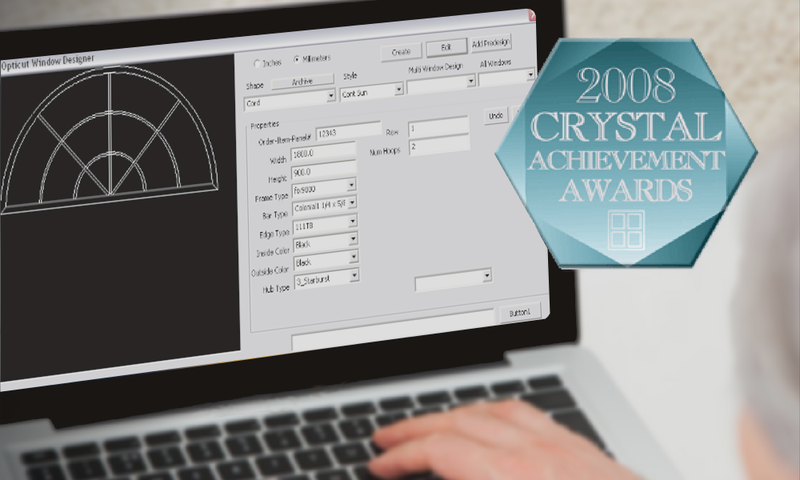 Opticut Technology and its General Manager John Ferreira won the 2008 Crystal Achievement Award for “Most Innovative Industry-Specific software”, given by Glass Magazine, the official publication of the National Glass Association, the largest trade organization in North America representing the flat glass industry. Ferreira, a University of Waterloo engineering graduate, has been associated with the window manufacturing industry since 1987. His award-winning innovation, GridLock, helps window designers and manufacturers make custom products more efficiently and cost effectively. Over his career, Ferreira has developed custom software for all aspects of the window business cycle, from estimating to material breakdowns to machine control. A number of years ago, Ferreira developed a web-based calculator to give manufacturers information for custom shapes. This however was very limited in scope and only addressed the main frame components leaving a large gap in required information. “After developing an automated grid notching machine, it was obvious a more efficient method was needed to enter information for non-orthogonal shapes and for ones with irregular spacing, he says. “And this was the impetus needed to develop the GridLock system. He says it was clear that same system could be used to automatically align grid bars between window frames. And then he incorporated a full-scale pattern projection to help in the manufacturing process. Using the Opticut GridLock system, window manufacturers can design, price and make complex windows and grid patterns with “CAD” accuracy in a fraction of the time. Ferreira accepted the award in Las Vegas at the National Glass Association trade conference and exposition, Glass Build America. President @Opticut – Creator of DaVinci 360, “Start to Finish” Software Solution for the Door & Window Manufacturer. Professional Engineer since 1983, I have been completely immersed in the design and development of machinery and software for the manufacturing sector. Making things more efficient is a way of life for me and something I thoroughly enjoy.